This is a guest post by FoL Alumni Rep Michael Westbrook, Housing Strategy & Commissioning Manager, LB Haringey. Housing is always a popular topic for alumni events, and this was no exception with around 40 people gathered to discuss alternative housing models over coffee and croissants at British Land’s head offices on 22 November. Many Future of London alumni work on the delivery of new homes, so the topic was highly relevant and a good opportunity to reflect on different ways of doing things. Alumni were joined by a panel of speakers, all of whom had a long track record in facilitating and undertaking alternative approaches to delivering new homes. LB Lewisham’s Jeff Endean spoke about the schemes they have recently pursued including facilitating two Community Land Trusts – one of which is self-build. The RUSS scheme now has planning permission for 33 new homes. Lewisham have also made use of modern methods of construction as part of delivering their housing strategy. This includes modular homes that are being used as temporary accommodation on a vacant site, before the homes are moved when long-term plans are agreed. Endean also set out the context that home delivery in London needs to be seen in – particularly the increased demand for affordable homes and the reduced supply of social rent. Rachel Bagenal, Co-Founder of Naked House – that provides striped back new homes without the often expensive fixtures fitted by mainstream developers – spoke about what motivated her and her colleagues – all of whom were private renters at the time – to set up the company. Naked House takes a pared back approach and passes on the savings to the buyer. Since most people would rather have more say over the look and finish of their homes themselves, this feels like a model that could prove popular with many people. The first Naked House scheme in Enfield is due to reach the planning stage shortly. Lev Kerimol of Community Led Housing London provided an overview of the sector in London. There is a recently-agreed definition of community-led housing which will help to ensure consistency and rigour for projects initiated under this banner that includes principles around meaningful community engagement, a long-term role for the community in the new homes and a clear articulation of the benefits of a scheme to the local area. Kerimol made the point that while there are a number of grassroots community housing projects, developers and housing associations could invite groups to form and pursue a community-led scheme. UCL’s Iqbal Hamiduddin spoke about the latest research on Self Build, as captured in his recent book. The book presents overseas examples where self-build schemes are more prevalent and done at a larger scale. In countries such as Germany and Austria self-build represents 60% of new housing development whereas in the UK, a once significant part of the sector is now only 10% of new builds. Much of this is down to changes in planning and regulation, which have placed self-build approaches outside of the mainstream and favoured volume house builders. In response to questions from the audience, a number of themes emerged in relation to alternative housing models. A major one was that a key benefit of alternative housing is additionality. This is particularly relevant to small sites which may be otherwise overlooked in favour of land which will deliver a higher number of homes. Alternative models could therefore help to deliver homes which would not otherwise be built. Another theme was scalability, as many live examples of alternative housing delivery are currently small scale. Modern methods of construction are an example of a mode of delivery which is moving from alternative/small scale to much larger scale. The scale question moved the discussion on to some of the challenges. As you’d expect, a major challenge identified was funding – housing development even at a small scale requires a lot of money. Established house builders and local authorities can raise money easily. But it is much harder for community groups or small providers even if they have a viable scheme that could pay back the up-front costs. There are also challenges posed around current policies and practice, which are generally designed for ‘traditional’ approaches and can make it hard for alternative ideas to get a look in. 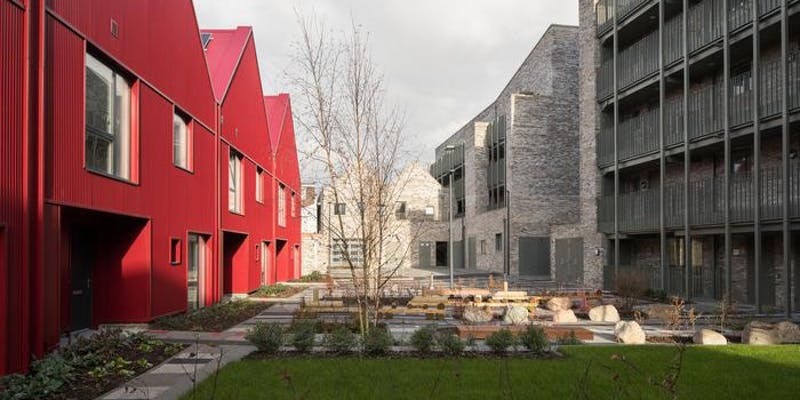 Despite the challenges, it was clear that alternative housing schemes – whether from examples underway in London or from abroad – have lessons that we can learn. The scale and impact of the housing crisis means that we need to do all we can to deliver the homes Londoners need, and alternative models have a role to play in that. This event was part of Future of London’s Alumni Network. To find out more and get involved, visit our Alumni Network webpage.